Frozen schnitzel makes an easy weeknight meal. You can find frozen schnitzel made with chicken, pork or veal at any grocery store. The healthiest way to cook frozen schnitzel is to bake the frozen meat in a hot oven. 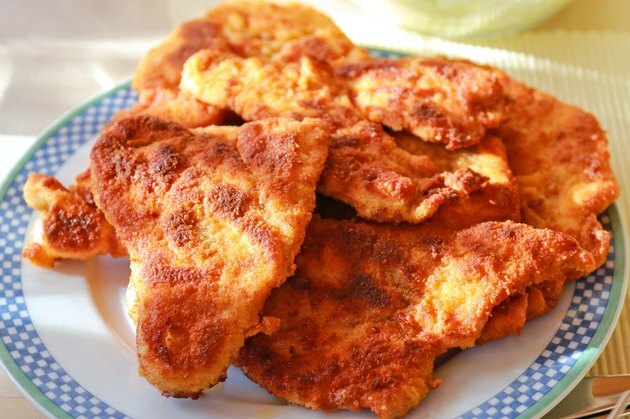 Frying schnitzel may be more traditional, but frying adds large amounts of fat and calories to the final dish, and you will have to defrost the schnitzel before you can fry it. Use an oven to cook frozen schnitzel and you'll wind up with a healthier take on the classic dish. Place a rimmed baking sheet into the cold oven and preheat the oven to 400 degrees Fahrenheit. Carefully remove the baking sheet from the oven once it is hot, and spray the sheet with a small amount of nonstick cooking spray oil. Place the frozen cutlets directly onto the baking sheet. Slide the baking sheet into the oven and close the door. Cook the schnitzel for 10 minutes, then remove the baking sheet from the oven and use tongs to flip the cutlets over. Return them to the oven and cook for another 10 minutes. Use a meat thermometer to test the schnitzel for doneness. Remove the schnitzel from the oven when its internal temperature reaches 165 degrees Fahrenheit for poultry and 145 degrees Fahrenheit for pork or beef. Serve the schnitzel warm with lemon wedges for drizzling. Place the frozen schnitzel on a microwave-safe plate. Heat a single serving of schnitzel on the microwave's high setting for 1 1/2 minutes. Cook two servings for 2 1/2 minutes. Use a meat thermometer to ensure that the meat is fully cooked. Remove the schnitzel from the microwave once its internal temperature reaches 165 degrees Fahrenheit for chicken and 145 degrees Fahrenheit for pork or beef. Let the schnitzel stand at room temperature for one minute to finish cooking before eating. If you use a convection oven, cook the schnitzel for seven minutes per side instead of 10. Choose frozen chicken schnitzel over other meats to reduce the amount of fat and calories in the final dish.